Kenneth and Evelyn Bledsoe organized Singing in the Pines in 1983, and the event has drawn people from the entire eastern United States ever since. This year’s event begins Friday, although people start pulling in campers and tents as early as Wednesday. 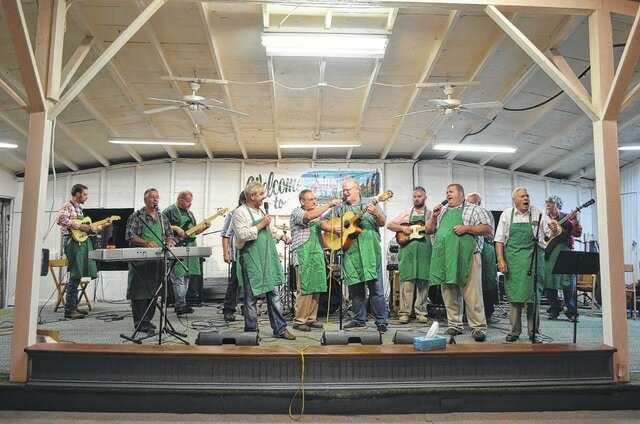 The “Pine Knots,” a group of volunteers at Singing in the Pines, are always the final act to close out the annual event. Consisting of everyone from parking attendants to concession workers, the group adds a little humor prior to a circle prayer by those attending. This year’s sing will be held Friday and Saturday at Union Campground in back of New Haven. NEW HAVEN — For the past 32 years, people from all over the eastern part of the United States have been gathering at a small, pine tree-laden campground in Mason County for an entire weekend of gospel music. The 33rd Annual Singing in the Pines will be held Friday beginning at 6 p.m., and Saturday beginning at 1 p.m. It is located at the Union Campground in rural New Haven, and admission is free. Held rain or shine, the sing draws soloists and groups from states as close as West Virginia, Ohio, Pennsylvania, Tennessee and Kentucky, but also from as far as Mississippi, Alabama, and Florida. Kenneth Bledsoe and wife Evelyn have been the longtime organizers of the event. Kenneth began the sing in 1983 when he was vice president of the now defunct Mason County Gospel Singers Association. The association wanted to start a gospel music event in an outdoor venue to draw people who might be uncomfortable in the typical church setting. Evelyn said the event is an “open sing.” Anyone wanting to sing signs up an hour before the event begins each day and then a drawing is held to see the order in which the singers will perform. Evelyn said there is usually between 40 and 45 signing up each day. The sing goes far into the night, sometimes not finishing until 2:30 or 3 o’clock the next morning. Soloists and duets are given 10 minutes to sing, while trios or larger are given 15 minutes. Many singers and attendees arrive as early as Wednesday. They bring campers, tents, and sleep in cars. A few years ago the sing made enough through concessions and donations that a large restroom and shower house was built. A picnic shelter has also been added for dining, and a huge potluck dinner is held on Thursday. After dinner, there is a preaching service and Evelyn said the grounds and seats are then anointed and prayed over. While there are wooden benches at the campground, Evelyn said many bring lawn chairs and blankets. People can come and go as they wish, and there are large open areas for children to play. Evelyn credits the many volunteers for the sing’s success. She said many people take vacation time from work to mow, help set up, run the concession stand, and the many other jobs necessary. Each year, Mark Hale of Huntington provides the sound system for free. One of the most anticipated events at the sing is the very last group to perform each year, the “Pine Knots.” According to Evelyn, this is when a group of the volunteers, everyone from parking attendants to concession workers, join to play instruments and sing. “We’re all a little loopy by then from being so tired, but it’s a lot of fun,” Evelyn said. She concluded that this year’s event, as in years past, will end with a prayer circle. For more information on the sing, contact the Bledsoes at 304-895-3845.